It's month two of The Polished Bookworms book club already! This month we chose Maze Runner by James Dashner. I just finished reading it last night, but right from the beginning I knew what I wanted to paint: the Grievers. It looked like an experiment gone terribly wrong- something from a nightmare. Part animal, part machine, the Griever rolled and clicked along the stone pathway. Its body resembled a giant slug, sparsely covered in hair and glistening with slime, grotesquely pulsating in and out as it breathed. It had no distinguishable head or tail, but front to end it was at least six feet long, four feet thick. ...Thomas wondered what- or who- could create such frightening, disgusting creatures. 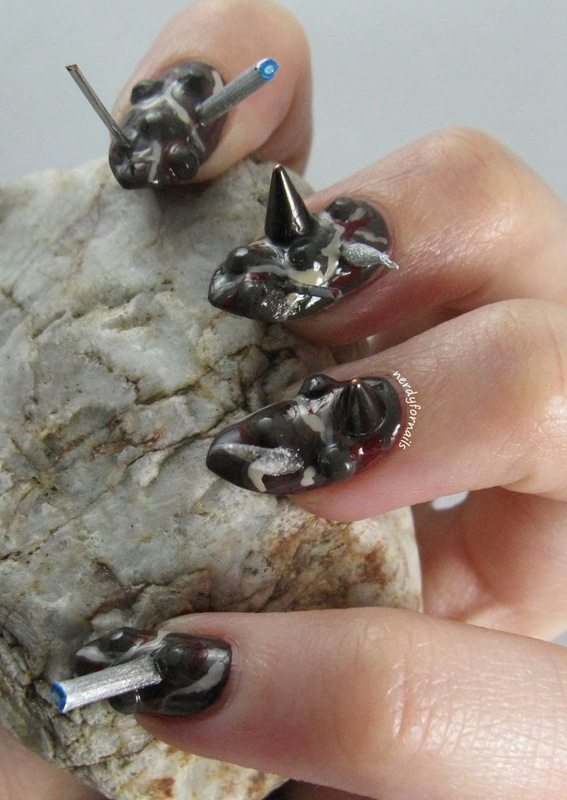 Of course I had to paint the most disgusting nails ever to capture the Grievers. I added some blood to my "needles" for extra grossness. I used quite a few things for this look. For the Griever's body I used my slug colored polish, China Glaze- Don't Get Derailed. 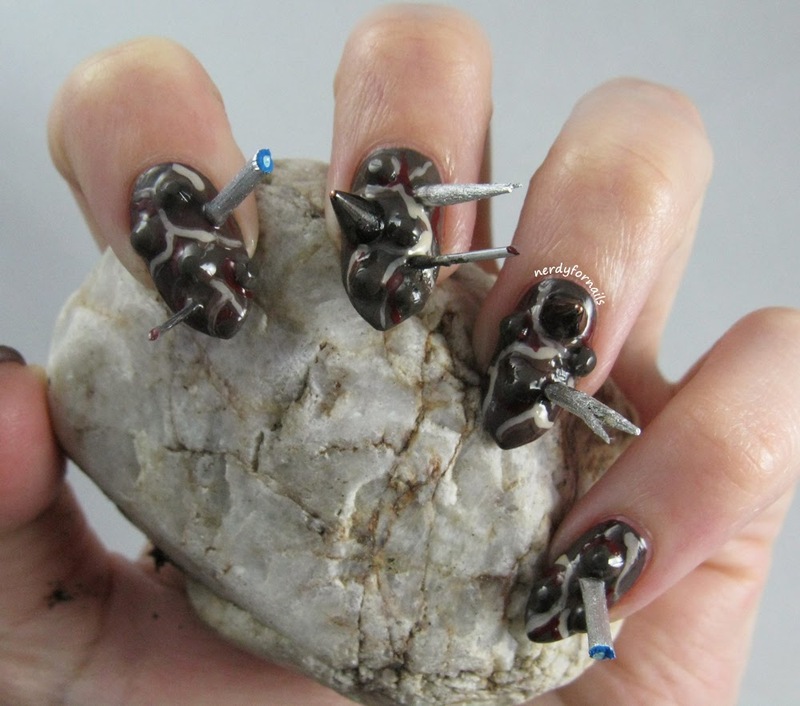 I placed rhinestones on the wet polish and then painted another coat over them to create the bulbous flesh. 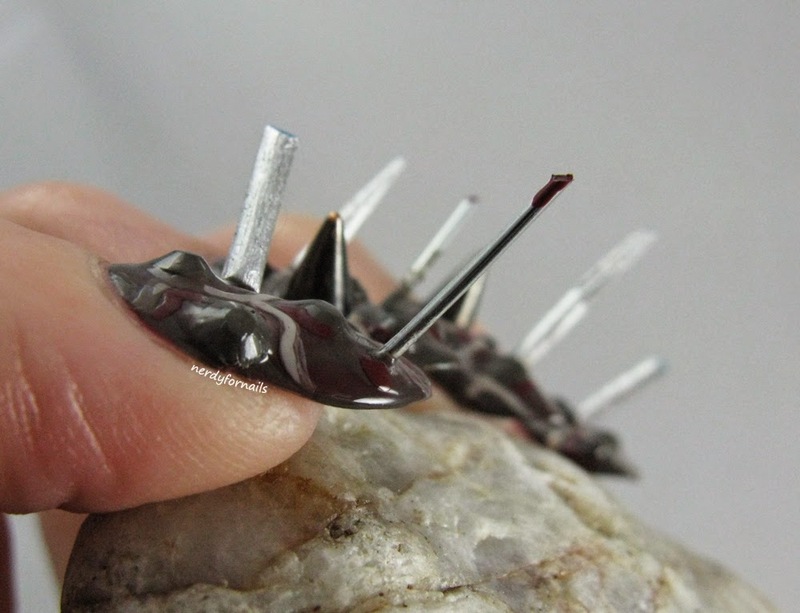 I painted toothpicks with OPI, Push and Shove to create the metallic appendages. 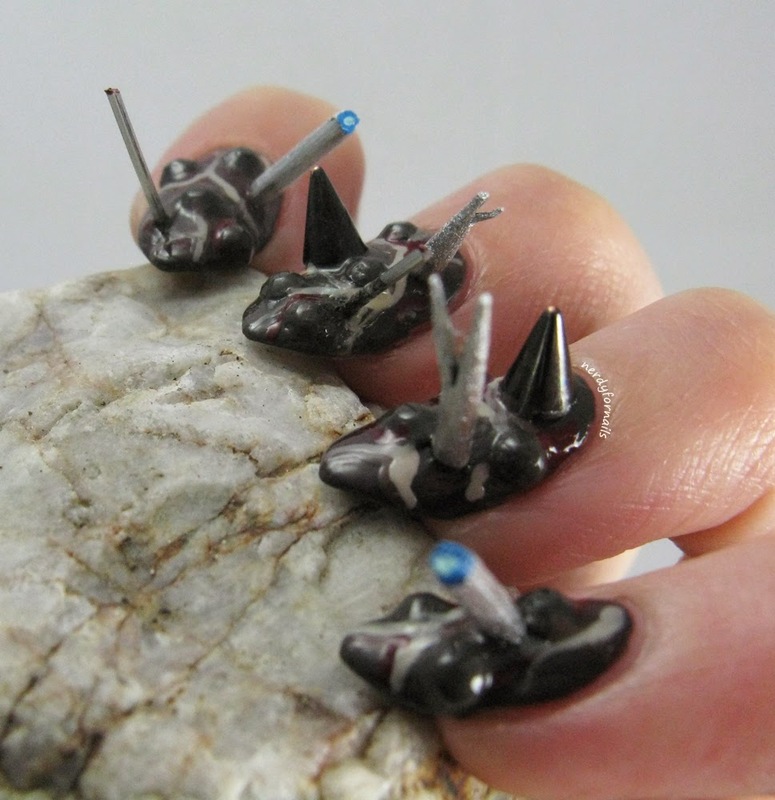 I also placed some spike studs from Miss A and cut up bits of a paper clip to use as needles. All of these things stuck pretty easily into the wet polish. I had the most trouble with the tiny needles, but they worked out in the end. Last, I drew in some veins using Spoiled- Pumping Gas, Finger Paints- Don't Make a Scene, and Zoya- Pepper. These weren't in the description, but I thought it would make my Grievers look even more disgusting. I really enjoyed the book and had such a fun time painting these nails. I can't wait to read the other two books in this trilogy. They left Maze Runner with a bit of a cliff hanger, so I'm definitely going to have to see what happens next. Sally Hansen has just released three new special effects collections based off of fabrics. The new line includes Velvet Texture, Luxe Lace and Patent Gloss. I received this red shade, Moto, to review and I'm in love. This red would have been perfect for Valentine's Day, but I received it just a few days too late. Really though, does anyone need an excuse for the perfect classic red? Above I have pictures with one and two coats to show just how fantastic the formula is. I think the second coat did give it a little extra shine, but the coverage and gloss was pretty great after only one coat. All of these pictures are without top coat to give you an idea of how shiny it is on its own. I added some later to speed drying time, but it didn't need it for the gloss factor. Moto applied very smoothly with no patchiness or pooling. 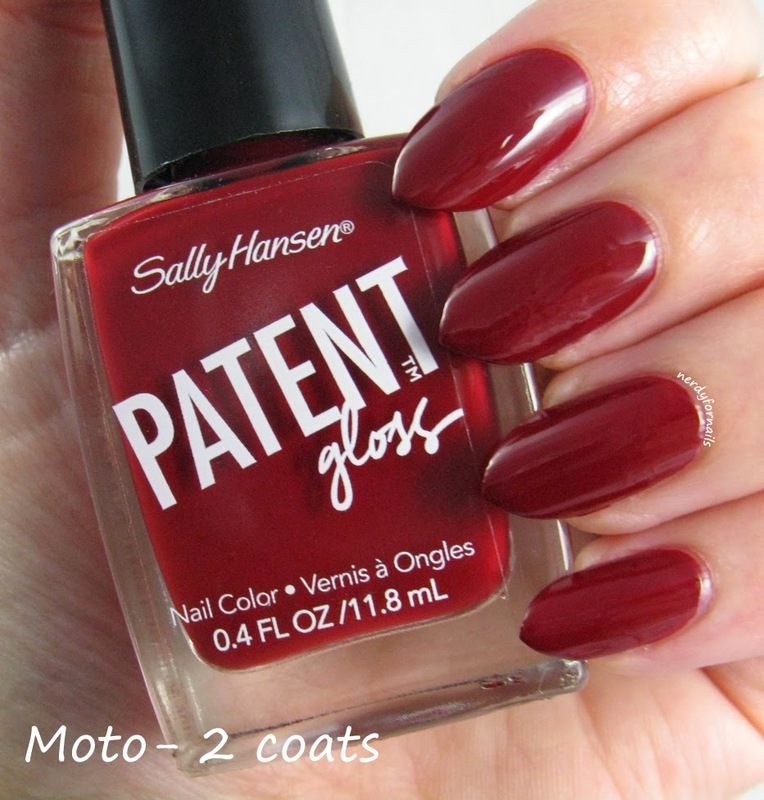 If you're looking for a super shiny easy to use red this is it. This polish looks bright in direct light, but the picture below is a bit more true to how it appears in most other lighting. It's a rich vampy dark red and still so shiny after two days of hard wear at work. I'm kind of dying to try the Velvet Textures now if they're anywhere near as great as this one. What's your go-to red polish? I think this might be my new one! Sooo... the 14th happened. 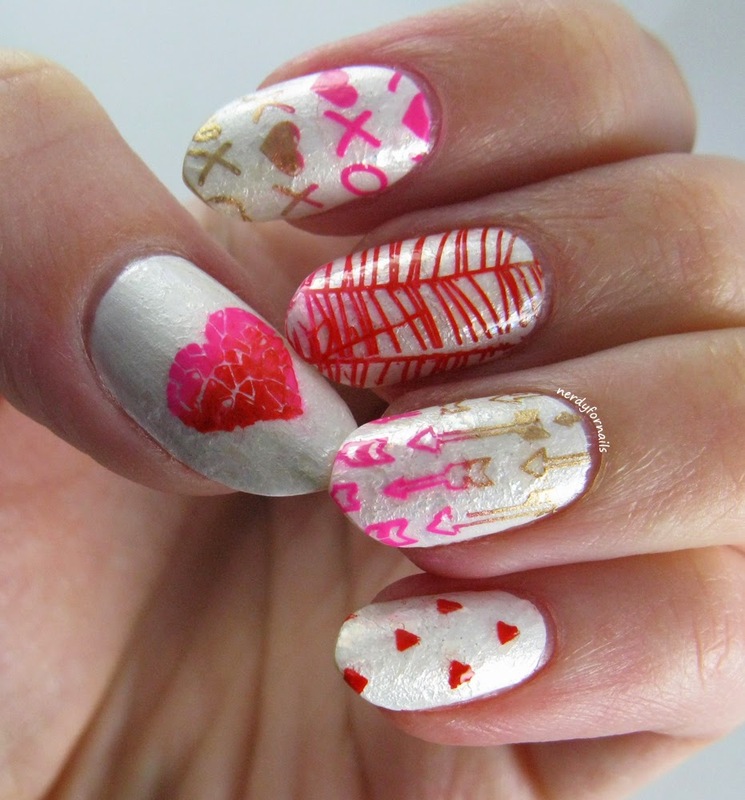 I'm so enthusiastic about Valentine's Day that I waited two whole extra days to get around to posting these nails. Today (Monday) we have a holiday from work and I took this whole mini vacation thing pretty seriously. Out of the three days I've spent well over 20 hours playing Elder Scrolls Online. Gaming is serious business. Even nail time must be sacrificed in the name of leveling. 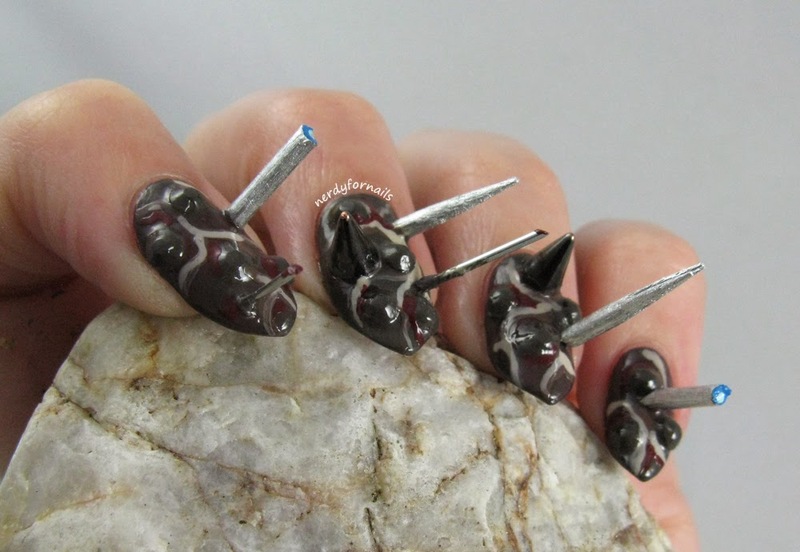 Anyway, here are some nails. 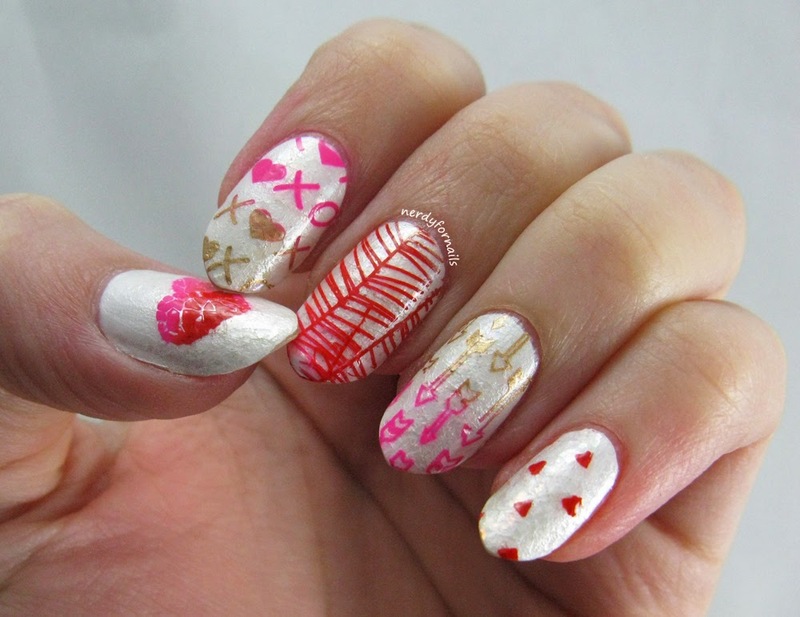 These are totally Valentiney because look.. hearts and stuff. My base is one coat of Sinful Colors, Snow Me White with one coat of Spoiled, Pearly White Teeth on top. This was followed by five coats of flakies which disappointingly didn't really shine the way I wanted. Flakies used: Finger Paints (from the Kaleidoscope Collection) Colorful Dream, Psychedelic Hue, Abstract Attraction, and Vivid Reflection. I also used Color Club's Snow-Flakes. I used a couple different Bundle Monster plates for the stamping- BM-411 and BM-606 The polishes are Red and Mexican Pink from Mundo de Unas and Maybelline's Bold Gold. I painted different colors across the stamping plates and gave it multiple scrapes to mix the colors together a bit for a gradient effect. How did your Valentine's go? Anything exciting? This manicure is getting filed directly under the category of "looked way better in my mind and then came out kinda like poo." 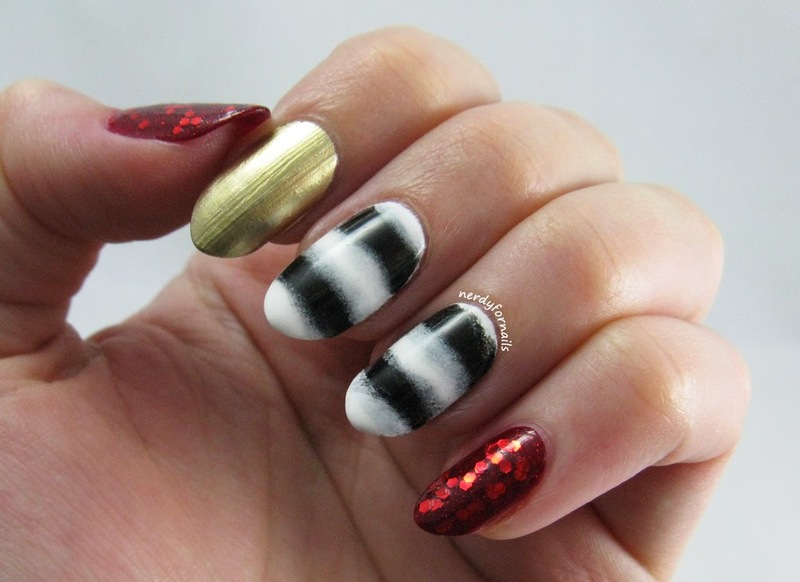 I envisioned sponged gradient stripes, blending flawlessly from black to while. 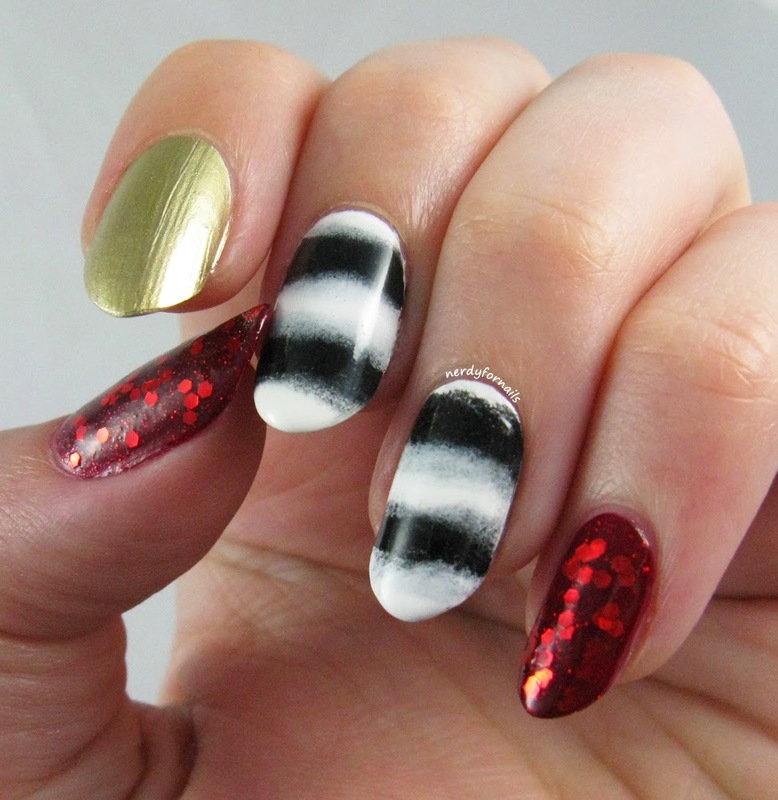 What I got was blotchy uneven weird stripe-like thingys and some skittlette nails that didn't quite go. I'm really troubled by this whole gradient stripe concept. Can it be done well? I've googled it and haven't found anything quite like what I'm looking for. I have a theory that maybe it would be easier to tape off sections and try to perfect one stripe at a time. It also needs more stripes. Two weren't enough. If I figure this one out you all will be the first to know. Sally Beauty Supply snowman shaped polish in Red Glitter topped with Milani Red glitter. 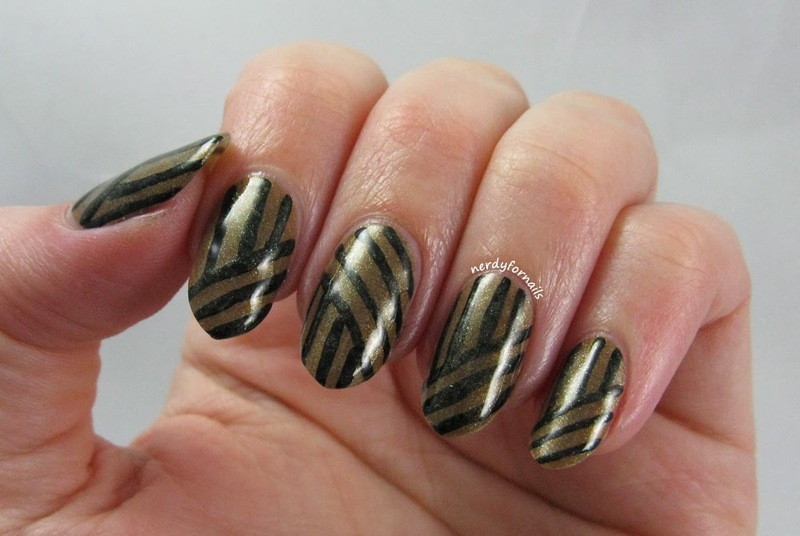 Sally Hansen Color Foil- Liquid Gold. It occurs to me that I'm kind of a jerk blogger. I hardly ever buy current collections. I wait for everything to go on clearance and then post about it a month or two later- just enough time to assure that whatever awesome polish I've posted is completely sold out. The worst part is that I don't feel bad enough to actually change anything. I'll tell myself that my blog is more about the nail art than the swatches. And it is... except when I'm feeling lazy.. which is pretty often these days.. which results in me posting swatches instead of nail art because they're less time consuming to write about. Ehhh. Sorry everyone! Sooo... this is Mind the Gap from the China Glaze All Aboard collection. There's a bit of art involved so it's totally ok that I'm posting this Fall 2014 collection polish about four months late. I got it on clearance right after Christmas so chances are you won't be able to find it in stores now. Thank goodness for the internet and the fact that this color is more than just a little bit drab. 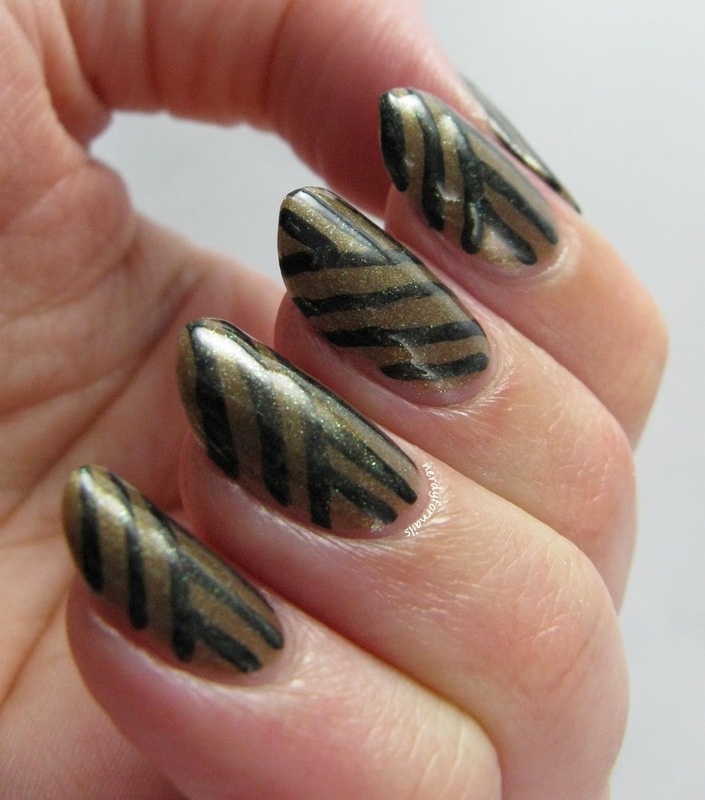 It's a golden-brownish polish with a hint of olive green and a slightly green shimmer. Isn't it hideous? I kind of love it. I'll admit I bought it just for the name, but the color grew on me. It turned out to be a near perfect match for this dress I bought myself during the after Christmas sales ($8.. crazy!). 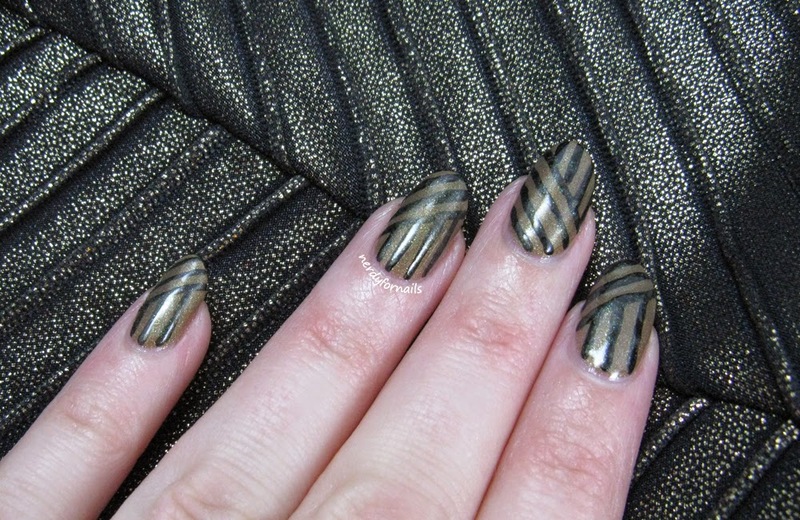 The dress has little gathered lines sewn into the fabric so I painted on some corresponding lines for my nail art to match the pattern. I started with two coats of Mind the Gap. This is a slow drying polish! Even with my fast dry top coat I got those annoying sheet marks after going to bed an hour later. It also made the nail art a little tougher to pull off because the polish was still very soft and dentable, but the formula wasn't too bad otherwise (you know, besides this one giant glaring problem). It didn't drag or pool which is always a plus. 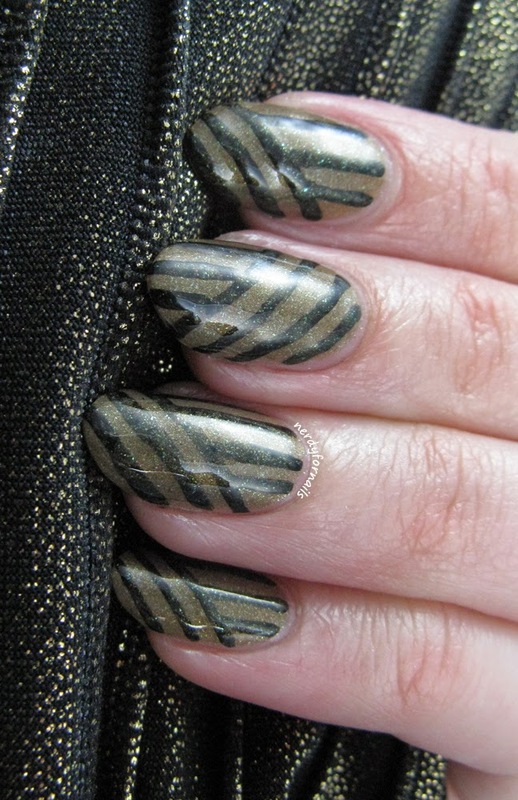 I painted on the lines with Sinful Colors, Black on Black and a nail art striping brush. For the finishing touch I wadded up a bit of saran wrap, painted some polish onto it and used it dab some of the base color on top of the black lines to tone them down a bit and blend them in. 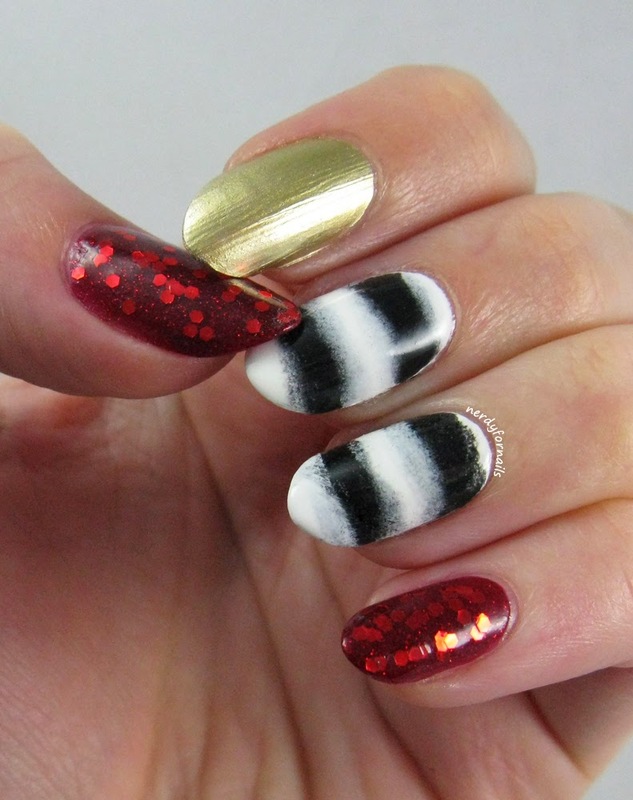 Since the little gathers on the dress still had the gold color I wanted to soften the black lines on my nails too. 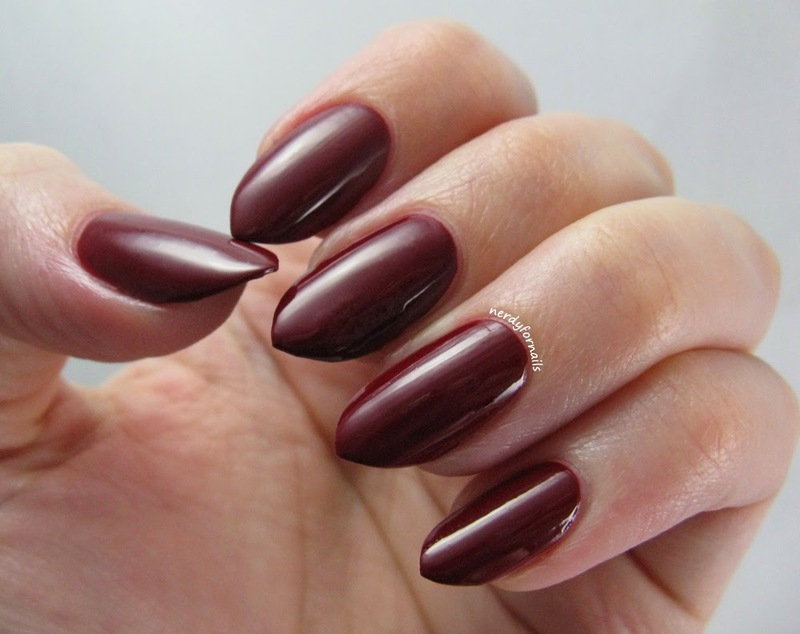 How do you feel about drab polish colors like this one? I wouldn't want to wear them every day, but I like having them as part of my collection.